The Cypher is an advanced survey instrument. It is very user friendly and uses digital technology to greatly enhance its operation. It works with most GM, proportional, and scintillator probes and displays the information on a backlit alphanumeric LCD. The display has a moving pointer bargraph that closely approximates a meter movement. It is smooth, easy to read and accurate. The digital level and the bargraph scale are also shown on the display. The instrument has many different modes including rate, integrate, and scaler. Each mode is independently programmable and may be turned off. It can be set up as a simple ratemeter with only one mode or it can be set up for all 6 modes. Thus it can be easily adjusted to suit your application. If that application changes it is easy to reconfigure for a new one. This instrument helps you get the readings you want. It is difficult to misread the data with the units and range information shown right on the display. The 4 soft-key buttons on the front panel operate the instrument. The two on the right are user defined. One user may want to use them for light and beeper while another may want to use them for range hold and reset. The soft-keys also help to simplify the operation of the instrument. There is only one level of display; you are never lost in a maze of menus. The digital nature of the instrument means that setup, calibration and maintenance are greatly simplified. Many of the operational and calibration functions can be controlled or set from either the front panel or the inside panel or both. The accuracy of the data is assured by a crystal controlled timebase and the switchable deadtime correction extends the linear range of most probes. 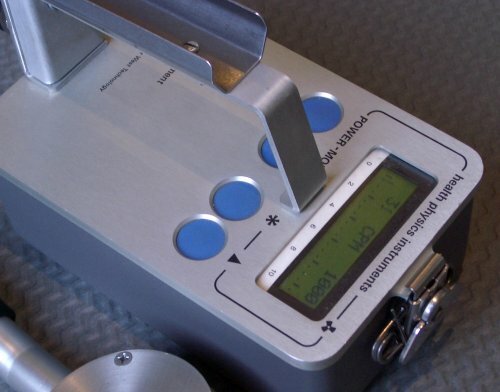 The Cypher survey instrument is small, rugged, and light. It is simple to operate, loaded with features and programmable for either simple or advanced uses. It is the perfect all around instrument. Size overall: 7.5 in. (19 cm) L x 4.2 in. (10.7 cm) W x 4.45 in. (11.3 cm) H w/o probe holder. Gasketed splashproof aluminum enclosure. Top panel is milled and anodized with nonerasable nomenclature. Bottom painted. LCD window is acrylic. Weight: 2.25 lb. (1 kg) with batteries. External controls: 4 pushbuttons (Power, Mode, *, and ). Power button when held down for 5 seconds resets the microprocessor. Internal controls: 1 pushbutton for entry into calibrate mode. Internal construction: Circuit board hinges for easy access. Batteries are mounted on an aluminum panel in nylon holders. ICs are socketed. All components are standard types. Probe clip: For 1" Dia handle. Others sizes available. Detectors: Accepts GM, proportional and scintillation probes. Display: 2 line x 16 character alphanumeric supertwist LCD with backlight. Backlight may be timed or on/off. Contrast adjustable from front panel. Audio: Built in piezo beeper at 2.4 kHz. Selectable to beep at every 1, 8, 64 or 2048 counts. May be switched to off, soft or loud. Single channel analyzer: may be switched in or out. Threshold, window & gain digitally set from front panel, internally or both. Gain has three settings, Threshold and window 200 settings. High voltage: Adjustable from 300 to 2000 Volts for GM and proportional detectors. 300 to 1600 Volts for Scintillators with 100 meg voltage divider. Actual measured HV can be displayed on the screen. HV monitored for proper operation. Batteries: 6 AA cells for 100 hour life. Battery condition displayed at turn on and turn off. Low battery warning during operation. 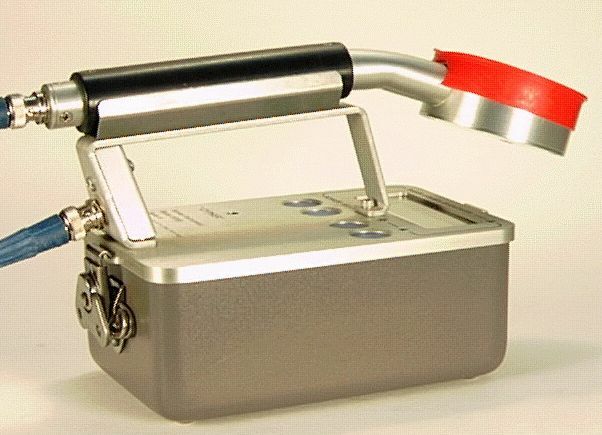 Instrument will automatically turn off when batteries are too low for proper operation. May be set for auto turn off. Calibration and parameter storage: Data stored in permanent memory for minimum of 40 years. Batteries not required for storage. Modes: 6 modes available, not all need be used; Rate, Integrate, CPM or CPS, Scaler, and 2 user defined to any mode with separate calibration. Calibration, Setup, and Maintenance mode also available. Units: rem, rad, R, Sv, Bq, dis, cts, CPM, CPS. Time base: /s, /m, /h Prefix: p,n,u,m,K,M,G,T and none. User defined units available. User defined keys: *, and are user defined soft keys for each mode. Power and Mode buttons are also used as soft keys for some functions. Menu selection: Simple to operate. Single level menus. Mode button will access all normal modes quickly and easily. Rate mode: Shows numeric value of rate with user selected units and timebase. Updated every second. Prefix automatically selected but may be preprogrammed. Limited to 3 significant digits. Autoranging w/range hold. Bargraph also displayed if desired. CPM/CPS mode: Same as rate mode except units are CPM or CPS. May also be programmed as cnts/m or cnts/s. Integrate mode: Shows Integrated dose or counts in user configured units. Also shows integration time. Scaler mode: Shows counts up to 6 digits. Count time variable from 1 sec to 999 min. Beeper from counts or timeout. Softkey * and key: User defined for rate, integrate, and CPM/CPS modes. Choices include: Light, Beeper, Hold, Reset, TC, and Range Hold. Bargraph: Moving digital pointer on background of scale markings. Updated 10 times every second. Full scale of 2.5, 5 or 10 and log are user selectable. Bargraph width is 2.2 in (5.6 cm). Markings for each scale are user changeable from inside the instrument. Full scale markings are actively shown on the display in the proper units & prefix but may be turned off. Additional setup options: Display exchange 1st and 2nd lines, time to range up, time to range down, min range, max range, decimal point-prefix change limit. Auto turn-off time. Range: 0.1 to 1,000,000 CPM with multiplier. Accuracy: Within 1% or 2 digits for Count rates from 1 to 1,000,000 CPM. Timebase is crystal controlled. Radiation accuracy is dependent on probe. Time constant: Dynamically set depending on count rate but has settings of short, med and long. Dead time correction: Corrects up to 10 times actual rate. May be independently set on or off for each mode. Temperature dependence: HV ±2%, Rate ±1%, over temp range. Input connector: BNC standard. MHV, C, and SHV also available. Options: Probes, cable and probe holder. Repair manual.